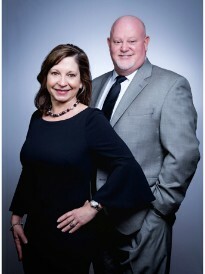 Andy and Laura Looker are the owners of The Looker Agency of Goosehead Insurance located in Matthews, North Carolina. In the years leading up to opening their agency, Andy spent 27 years in the mortgage industry as a top-producing loan officer, branch manager and regional multi-state manager. Laura has 18 years of business/management experience working with former governors, U.S. senators, federal judges and lawyers in Washington, DC and North Carolina. Andy and Laura are committed to providing a true concierge client experience that is unique in the industry. As independent agents, they quote from numerous A-rated home and auto insurance carriers. With the latest technology, along with a 100% licensed customer support team, clients know their service requests are taken care of by a knowledgeable team. Andy and Laura look forward to time with their only son, Andrew Jr., who is a Liberty University student in Lynchburg, Virginia. They enjoy mountain hiking as a family, time spent at the ocean, being involved at their local church and relaxing with their Westie and Poodle on their back porch retreat. Call the Lookers to give you a no cost, no obligation, unbiased review of your current insurance coverage giving you the power to choose. SERVING OUR NEIGHBORS IN NORTH & SOUTH CAROLINA!